Chris Howard our Osteopath and Mistiyan , now known as Natura Class. Many others have also been long and loyal clients and we appreciate all your past and, hopefully future business, it has been a pleasure working so many people who approach their work with honesty and integrity. Looking ahead, none of us can ignore the changing landscape of our world, both environmentally, financially and spiritually, and we are at the forefront of this movement, looking for new ways of working and building sustainable business practices. 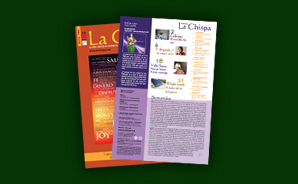 Through the magazine and our web site, www.lachispa.net, we provide tools for positive change and a forum for personal development and open minded thinking. Keep up to date with our fortnightly e-newsletter by signing up on our home page. This entry was posted in Healthy Living and tagged eco living, healthy living. Bookmark the permalink.